Blastoise: The turtle we all know and love. One of the original three starters. Evolves from my favorite Pokemon, one of the cutest ever, Squirtle. We haven’t seen him as a 1 prize attacker since the BW era, with that classic take on the Rain Dance Ability. So let’s take a look at this Blastoise and compare it to the meta today. 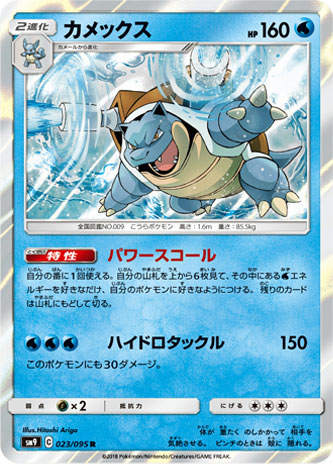 Blastoise is a 160 HP Stage 2 Water Pokemon, with an ability and an attack. Power Squall states this: Once during your turn (before you attack) you can look at the top 6 cards of your deck, attach as many [W] energies as you find their into your hand, and shuffle the other cards back into your deck. At a first glance, this card may seem really bad compared to the older ones, but I feel like it has its uses. It can allow you to see some cards in your deck, which is always useful, but it really comes down to how many Water energies you have. Its attack is Hydro Tackle, it’s a 150 for 3 W energies attack which does 30 damage to itself. Hmm, where have we seen an attack like this before? Oh, on Blastoise EX. It’s not necessarly bad, but it’s not the best. It’d have some good partners like maybe Swampert from CES, or I was even thinking Feraligatr from DRM. The most obvious partner is Magikarp and Wailord Tag Team GX, but that’s not always best for a single prize attacking deck. I’m definitely going to be playing a lot of Blastoise though, and I just love all the arts for his evolutionary line. That’s all for my rambling today, thanks to Harvey for letting me type this article, and until next time, this is Red_Ninja_Red, signing off!